Good morning! Are you ready for Spring? Oh, I sure am!! Another 6 inches of snow on the ground, and all I can think about is warmth, sun, and flowers. That's what I've got for you today for the Peachy Keen Challenge #22. Our challenge this week is a sketch challenge, and I tried something new for this card, well, actually new to me as far as papercrafting. I got out my acrylic paints for this card. Oh my goodness!! It felt so good to paint again!!!! I haven't had an actual paintbrush in my hand for somewhere around 8 years. Painting on paper is something that I've never tried, but it worked beautifully. I did take Kathy J. 's advice and use a gel floating medium, so as not to allow additional liquid on the paper. It worked great! I painted the paper with the same tole painting techniques that I was taught and used to teach. I guess it's like riding a bicycle. You never forget! Whew!!! THAT was a relief, because there's sure plenty of other things that I can't seem to remember!! These adorable flower images are from the Peachy Keen stamp set PK-229 Funny flowers, and the DP that I used for this card is from the Garden Party stack by DCWV. There's a little bit of a blue stripe in the green and white checked paper that really ties the blue flower in with the pinks and browns, but it doesn't show up very well in the photo. The card stock is all from Stampin' Up!, as is the lattice Sizzix die. The only embellishments I used for this card were the three dew drops, and that wonderful Martha Steward taffeta ribbon with the words. I love that ribbon, because I can add a sentiment without taking up any additonal space on the card. This image was stamped onto kraft card stock, then painted with an assortment of Folk Art acrylic paints. I followed the sketch to the letter, adding only the lattice die cut as an extra element. Thank you so much for stopping by today. 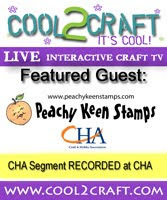 Please be sure to check out the Peachy Keen Challenge Blog for all of the wonderful cards the rest of the PKS design team will have for your inspiration. Once you see all those gorgeous creations, your surely going to want to join the fun. Just add a link to your work of art with Mr. Linky, and show us what you've got!! There is always a fabulous prize for one lucky winner!! Have a wonderful day, and happy stamping! Great card. You definitely still have the painting techniques!! Thanks for sharing. WOW Lori, this is so beautiful. I am speechless, you are a truly talented artist. Lori this card is absolutely gorgeous! Love your painting hon! You sure did a great job with it...and the image is just way sweet! Lorie, your acrylic coloring is OUTSTANDING!! Girl, you're magic with colors of every kind!! I really love that sizzix lattice too, I've never seen that until today. Another ADORABLE card, Lorie-dear!! oh how amazing! I was waiting for you to break out the brushes - you've been talking about it for a while now - and wow! This is some amazing stuff my friend. The colors are soo vibrant. Another winner for you amazing lady! This is fabulous. I love the expressions on their faces, and your coloring is just awesome. Lorie, this is stunning! Your painting is perfection and I love the bright colors!! That lattice looks terrific on this card! Holy Canoli Lorie!!! ;o) This is sooooooooooooooo CUTE!!! Totally put a cheery smile on my face! Your painting totally rocks! LOVE that die cut too...SOOOOO PRETTY! I have a feeling the paintbrush is going to be in use often now that you loaded it up again. Your painting is amazing! Standing "O" on this card...you amaze me daily...your coloring abilites no matter what medium are outstanding...This card is da bomb....Way to go Lorie. UNREAL! LORIE!! You did a super fabulous job on this card! Your painting is superb to say the very least! You put me to shame! I love acrylics and I know there is nothing more vivid.. BEAUTIFUL JOB, my friend! Right! That's it!!! You're emigrating to the UK so you can teach me how to paint as beautifully as you do. This work is in a league of it's own my friend and I'm SO jealous of your talent! You and Kathy are the BOMB!!! Oh Lori, I always admired your water coloring, but not with paints too!!! Does water coloring work with Digi's? Wow! Lorie, I am blown away by your awesome talent, my friend! This image painted with acrylic paints is so vibrant it just pops right off the card. Sure wish we lived closer so I could take lessons from you. You are the master!!! Adorable card! Your coloring is outstanding! Darling image! WOWIE!! Super cute flowers Lorie, and your coloring is AMAZING!! Seriously--I wish I could do that, LOL! LOVE the brown color behind them. You are too creative! Hi Lorie, your card this challenge is awesome! I love the way you painted the little flowers. And the lattice die cut is gorgeous! Beautiful Job!! Double The Challenges... Double The Fun!! The Stamping Boutique Challenge Day!! Double The Challenges...Double The Fun!! !